X-linked myotubular myopathy (XLMTM) emerges from mutations in the MTM1 gene and affects around 1 in 50,000 live-born male infants. This congenital myopathy has currently no treatment and leads to a severe impairment of motor skills and ventilation and premature death. 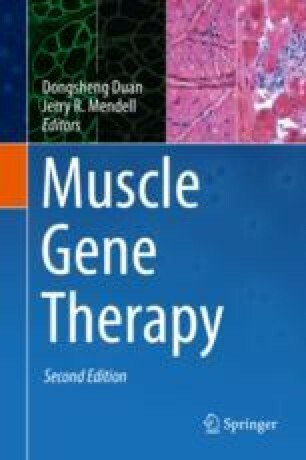 In this chapter, we synthetize the results of gene therapy studies using recombinant adeno-associated vectors in preclinical models of X-linked myotubular myopathy. Over the past few years, the field has rapidly moved from myotubularin-deficient mice to dogs and has now begun the first clinical gene therapy trial for XLMTM. In both mice and dogs, a single intravenous injection of adeno-associated vector leads to a complete rescue of key pathological phenotypes, including motor and respiratory functions, and life expectancy. Despite the treatment being well tolerated in both animal models, we also interrogated some of the issues commonly encountered in gene therapy studies, notably immune responses against the vector capsid or the transgene product, genotoxicity, and off-target effects.